With the exception of the two early festivals, pre – 1959 posters and programme covers maintained a consistent style – a simple use of symbol and title on coloured, textured papers. 1959 saw the start of the multi-coloured covers with a style change every year. 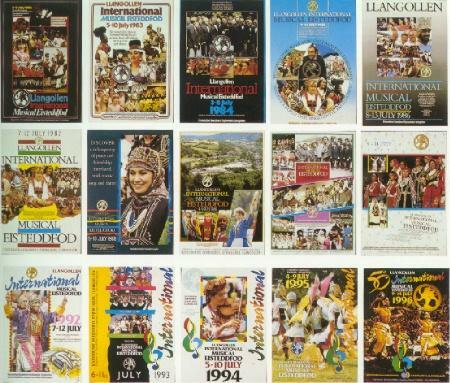 From 1972 to the present time (1996) Mike Flory, the senior graphic designer at Smurfit Print UK, Llangollen, (formerly Dobson & Crowther) has provided, voluntarily, the graphic styling for the Eisteddfod, producing the designs for posters (above), programmes, stationery, display and publicity material; a huge contribution often overlooked. Mike Flory has also been responsible for the cover design on material for the 50th year.